With the Star Trek film out on Friday, it’s high time everyone started cashing in on Kirkmania and, after Toshiba’s protective plastic, it’s now the turn of the Star Trek Communicator VoIP handset. Now, before you get too excited, this device is a lot more useless than you might think. Yes, you can use it for Skype or whatever kind of chat service you use but only when it’s plugged into your computer via USB. There is Wi-Fi or 3G involved here. 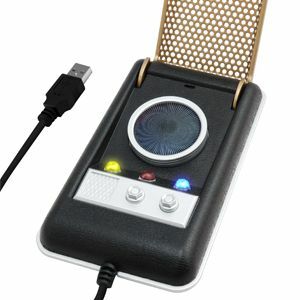 On the plus side, if you are an incurable Trekkie, then you’ll be pleased to hear that it comes complete with 21 different communicator sounds and a six foot USB cable with which to parade your new toy about while in your Star Fleet Dressing gown and Tribble slippers.